Lois Jackson Buttrey, age 64, of Ashland City, TN passed away on Monday, November 26, 2018 at St. Thomas Midtown in Nashville, TN. She was born in Clairfield, TN on May 13, 1954 to the late John Andrew Jackson and Nornia Jackson. She is also preceded in death by one sister. Lois is survived by her husband of over 45 years, William Buttrey. She also leaves behind her children, Valerie Mills and William “Bill” Buttrey; grandchildren, Eddie Mills, Joey Mills, and Katie Barnes; and six siblings. 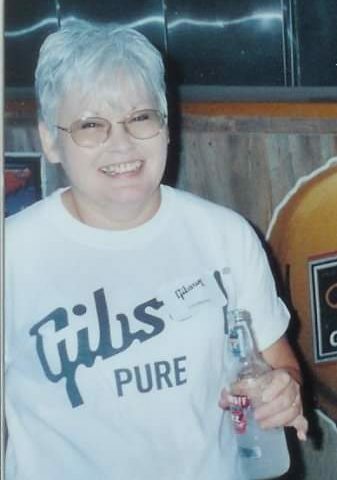 Lois worked at Gibson Guitar for 20 years. Her family will always remember her love of drawing and Elvis Presley. A Celebration of Life will be held on Friday, November 30, 2018 at 11:00am in the chapel of West Harpeth Funeral Home. Visitation will be held on Thursday, November 29, from 4:00pm until 8:00pm and again on Friday from 10am until the time of service. Lois will be laid to rest at Harpeth Hills Memory Gardens. So sorry for the loss of such a special and sweet friend. God Bless and comfort the family during this time of sorrow. Prayers for peace and comforting. I love you aunt lois!! I miss your beautiful smile already!! Lois you will be missed by so many people who loved you. You were a gift to us all who knew you. Your smile and sense of humor and just beautiful insude and out. RIP my friend. So many fond memories of Lois and William when I was growing up hanging out with Sandra Kay.. Lois’ smile would like up the room. Praying for William and the family to find comfort to get through this very hard time. What a sweet woman you were and I had the pleasure of knowing. May your family and friends find comfort in your sweet smile and wonderful memories you all shared. Rest with the angels always watching over and guiding your loved ones here in earth. Our thoughts and prayers going out for the Buttery and Jackson families! ! Lois will be sadly missed by many. R.I.P my friend! ! ! To a beautiful woman, friend, Mother, sister, aunt, grandmother and a true blessing that God shared with us for so many years. God has now called her back home. She has finished her journey here on earth set forth by our Lord and Savior above. For today we are feeling a little lost but, she is rejoicing with Our Lord Jesus Christ and Father God. What an amazing Angel she will be. We send love and peace to all of her family and friends. We are here for you strawberry and love you as one of our own children. My beautiful aunt Lois. I will always cherish my time with you. You always had me in tears with laughter. Thank you for loving me and being my favorite aunt. I look forward to seeing you again in heaven. Wait for me by the gates. I love you and will miss you always. Lois you were a beautiful woman inside and out. You were like family to me and always treated me as such. My deepest sympathies to all the family. Say hello to Melanie and give her a hug for me til we all meet again. Love you. So sorry for the families loss. May God wrap his arms around them and held this time of need. My prayers for comfort for the family. Loved Ms.Lois. Wish I had one more lunch with her. She will be greatly missed by a lot of people. Take comfort in the knowledge that she is in a far better place than we. All her pains and struggles are over. Rest easy my dear friend. My thoughts and prayers are with the family at this time of loss. I will pray for peace and comfort for all of you. Lois was so very sweet and loved by so many. She will be missed. I grew up with all of the fun loving and beautiful Jackson girls. Her sister JoAnn and I did a lot together. Lois was always so welcoming & loving & her smile & Gods light in her was unmistakable. My sincere condolences pour out to all of the many that loved this precious woman. William, May God give you the strength to carry on until you both meet again. My condolences to the Buttrey & Jackson families.